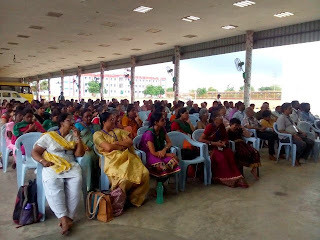 The Ten days’ teachers’ training program of Samskrita Bharati North Tamilnadu came to a remarkable end with Shri Keshavan Treasurer, Maharishi International residential schools and Shri Dinesh Kamat National organizing secretary of Samskrita Bharati as the chief guests and Shri Kartikeyan Chief of the ten days’ camp adorning the dais. The program started with “Anubhava Kathanam” where the students of the camp narrated their experience of the 10 days’ program. For many of them it was an incredible experience that they could converse in Samskritam now! Many vouched to work along with Samskrita Bharati for the cause of the language. A Tamil research student from Delhi proclaimed that he found that Tamil and Samskritam have a huge volume of common vocabulary and said that as a bounty he would work to bring out the language to the commoners. This event saw students from the age of 7 to 70 sharing their experience brimmed with enthusiasm. A brief introduction of the chief guests was followed. A pertinent speech about the school’s attachment with Samskrita Bharati was made by the Treasurer of Maharishi International schools Shri Keshavan. He never failed to impress the audience with his incidental attraction towards the language and his thirst to learn the same. A well-articulated speech in Samskritam was delivered by Shri Kartikeyan on the importance of learning the legendary language. After a brief Samskrita-song Shri Dinesh Kamath rendered a speech on the works of Samskrita Bharati and the never-ending treasures found in the language. All the organizations and individuals were remembered, appreciated and thanked for bringing the desired success to the program. The program came to an end with the chief guest Shri Dinesh Kamath’s request to the audience to contribute for Samskrita Bharati’s novel aim of bringing Samskritam into the school syllabus from 1st standard onwards.